Now five to six players can sail into the wild, uncharted seas and explore and settle the many mysterious islands near Catan. All one or two more opponents without sacrificing ease of play. Try one of 9 new scenarios! This rich extension adds even more drama to the award-winning game of seafaring, discovery, and trade. Settle islands, build ships, and chart the nearby waters. Discover far-off mines and use your gold and resources to become the undisputed ruler of Catan! This is NOT a complete game! 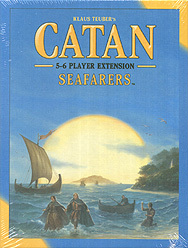 You need a Catan game, a Catan 5-6 Player extension, and a Catan: Seafarers expansion in order to play with this game extension.